The trip to the 2003 Great Western Bicycle Rally was approaching and I still didn't have a trailer. I was looking around for a trailer when I decided to build my own. I picked up some 3/4 x 0.049" cro-moly tubing from Aircraft Spruce and I drew up a few design on my computer. When I finally liked one, I started bending the tubing. When I tacked the tubing together, the trailer looked a little to tall and I decided to lower the height to match the height of the back rack. I figured, the taller the trailer the heavier I will pack it, so I had no problem making it six inch shorter. I used some bright green parachute material and some corrugated plastic ( the stuff used for sings) for the sides. For hitch I bought a quick release ball joint from McMasterCarr and for finish, I had it powder coated black. When I was finished, it weight in a 28 lbs. 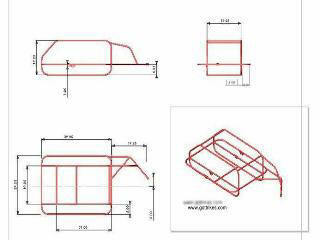 The next trailer I will build, I will use 3/4x 0.035" tubing to save some weight. The first test, had to be done on the road since I didn't have much time before the trip I build it for. I worked out good, down the hill before Gaviota it followed wonderful at 50 miles per hour and a total weight of 100 lb. I didn't even knew that I had it behind the trike except I felt the affects of gravity pushing me forward. If you'd like a copy of the drawings please download the PDF by clicking on the drawing above and E-mail me for the password. If you have problems with the download, please notify me and I will send it as an attachment.